The recent IPC/BC proposal for Improvements and Enhancements to the RPMs for new gTLDs [PDF, 68 KB], strictly focusing on implementation versus policy issues. The business and contractual framework for the Clearinghouse. Implementation architecture for Sunrise and Trademark Claims. Representatives from the Business, Intellectual Property, and ISP constituencies, the Noncommercial, Registrars, and Registries stakeholder groups, and the At Large Advisory Committee joined these discussions in the spirit of reaching implementation solutions. They focused strictly on finding common ground and to advance the discussion on implementation solutions; they were not policy-making meetings. To kick off the discussion, I introduced an overview of the gTLD Services department ICANN is building, to include staff resources working on DNS industry engagement, gTLD service operations, and gTLD support. 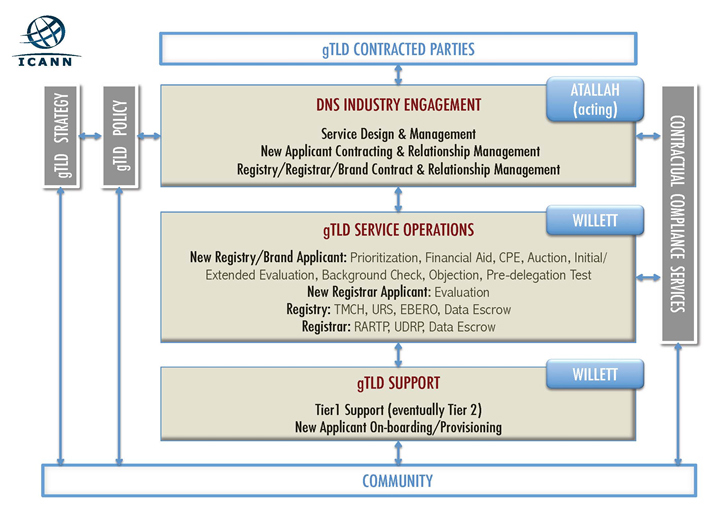 Until the first new gTLD is delegated, Akram Attalah and I will personally oversee the whole New gTLD Program. Extend Sunrise Launch Period from 30 to 60 days with a standardized process. Extend the TMCH and Claims Notices for an indefinite period; ensure the process is easy to use, secure, and stable. Complete the URS as a low cost alternative and improve its usefulness - if necessary, ICANN could underwrite for an initial period. Implement a mechanism for trademark owners to prevent second-level registration of their marks (exact matches, plus character strings previously determined to have been abusively registered or used) across all registries, upon payment of a reasonable fee, with appropriate safeguards for registrants with a legitimate right or interest. Validate contact information for registrants in WHOIS. All registrars active in new gTLD registrations must adhere to an amended RAA for all gTLD registrations they sponsor. Enforce compliance of all registry commitments for Standard applications. Expand TM Claims service to cover at least strings previously found to have been abusively registered or used. The group determined that items 5, 6, and 7 above were already under consideration on other tracks and those were deferred for this discussion. The group discussed a possible decision tree as a tool for considering whether proposed changes were appropriate for policy or implementation processes. ICANN's policy team will continue to advance this decision tree with the community in a formal way, to create and document these decision-making mechanisms. For this meeting, the group decided to focus primarily on finding the right solutions, and then later to address how the solutions should be considered, adopted, or implemented. In addition, we acknowledged the need to address separately how elements of these solutions might apply to legacy gTLDs, but did not make this a pre-requisite for developing the strawman solution. The group discussed/collaborated on a possible strawman solution addressing a number of these elements. A Trademark Claims period, as described in the Applicant Guidebook, will take place for 90 days. During this "Claims 1" period, a person attempting to register a domain name matching a Clearinghouse record will be displayed a Claims notice (as included in the Applicant Guidebook) showing the relevant mark information, and must acknowledge the notice to proceed. If the domain name is registered, the relevant rightsholders will receive notice of the registration. 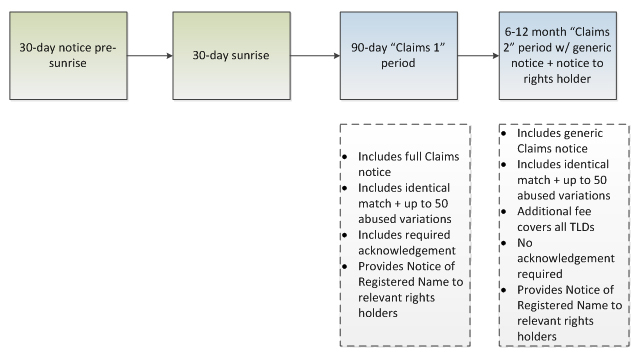 Rights holders will have the option to pay an additional fee for inclusion of a Clearinghouse record in a "Claims 2" service where, for an additional 6-12 months, anyone attempting to register a domain name matching the record would be shown a Claims notice indicating that the name matches a record in the Clearinghouse (but not necessarily displaying the actual Claims data). This notice will also provide a description of the rights and responsibilities of the registrant and will incorporate a form of educational add-on to help propagate information on the role of trademarks and develop more informed consumers in the registration process. Possible blocking mechanisms were discussed, but were not included in the strawman model. I provided an update on the expected contractual framework for operation of the Clearinghouse. As announced earlier this year, ICANN staff is working with Deloitte, IBM, and CHIP to deploy the Clearinghouse. The structure was re-designed to give ICANN maximum flexibility and the ability to provide the best possible stewardship of the database. The group reviewed and discussed a set of questions related to the functional specifications of the interface between the Clearinghouse and registries and registrars. We made significant progress and will publish the results of the discussion on the tmch-tech mailing list. We plan to continue consultations with the community on the remaining questions. We will have follow-up informational calls in November with the group to do three things. (1) Review any additional feedback from the stakeholder groups, (2) Convey staff's view on a path forward on some or all elements of the strawman solution, and (3) Convey additional details on the Trademark Clearinghouse contracts. We are now firmly focused on moving forward with Trademark Clearinghouse implementation to ensure that the New gTLD Program is launched in accordance with our targets. Next, I will focus on URS and RAA. Thank you to all the stakeholder groups for the many hours of hard work!